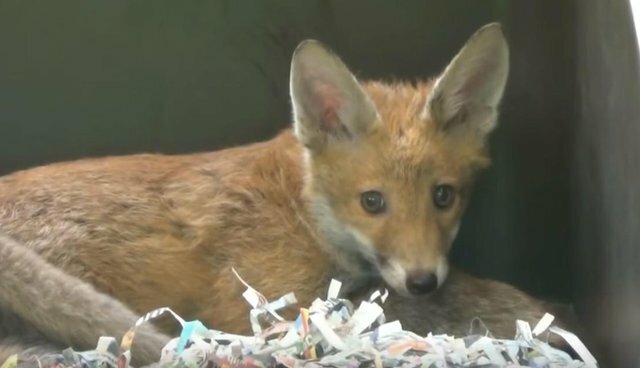 Earlier this year the League Against Cruel Sports made the national news after we discovered 16 fox cubs in a barn which was close to the kennels of a hunt. The cubs are now free - but how did we find them, and why were they there? We can now reveal the whole amazing story - which was only possible thanks to our supporters! When one of the League's undercover investigators got a tip off about some foxes being kept in a barn in May this year, he knew he was onto something. A few basic checks showed that the barn was close to the kennels in North Yorkshire where the Middleton Hunt keep their hounds. A strange coincidence, or something more sinister? We quickly put together a team of investigators and one dark night they entered the barn. Using infra-red cameras they quietly took a look around - and were shocked at what they saw. No fewer than 16 fox cubs were hiding in the barn, which had effectively been turned into an artificial "earth" containing old pipes for them to hide in. The remains of dead chickens were strewn across the floor, while the cubs cowered from the lights. Our team got the video evidence they needed, then got out. But the job wasn't yet done. We knew the fox cubs were in the barn - but why? Who was keeping them there? The team watched the barn from secret locations and after two days, someone showed up and entered the barn. The man had driven to the barn from the hunt kennels, and we knew who he was - the "terrierman" employed by the hunt. For many hunts, the terrierman is employed to send his dogs underground to flush out foxes when they escape into tunnels. We now knew who was keeping the fox cubs - and we had a very strong idea as to why. So why were foxes being kept in a barn so close to the hunt kennels? The Middleton Hunt states that they engage only in trail hunting and that they do not hunt foxes illegally. However this is the same hunt whose huntsman and terrierman were convicted in August 2013 for illegally hunting a fox; whose terrierman was convicted in February 2015 for illegally blocking a badger set on the morning of a hunt meet; and whose same terrierman was now filmed visiting the fox cubs at the hunt kennels. In our opinion, there can only be one explanation - the fox cubs were being kept so that they could be hunted illegally. Traditionally hunts captured fox cubs and kept them in artificial earths (for example, old pipes) where they will be fed. This is to ensure that the hunt always has foxes to chase: if they can't find a fox "naturally," then the terrierman will be told to flush the captive foxes towards the hunt. We believed this practice was still going on, but getting video evidence of this taking place is extremely difficult, so this was a massive success for us. "Anyone seeing this footage can now see what a despicably false argument that is. Hunting with dogs is nothing to do with fox control. It is simply a cruel sport, nothing more - and now it is clear that it is even crueler than most people ever knew." We notified the police, and they searched the barn and rescued the cubs. They were taken to an animal rescue center where they were treated for various conditions - unfortunately one didn't make it. But the rest were soon released into secret sanctuary locations where they recuperated before being released back into the wild, where they belong. "We have received a number of reports this year via our Wildlife Crimewatch line of similar activity being carried out by hunts throughout the country. We also received further tip offs after we released the story about the cubs to the media. We are currently following up those leads and are confident of obtaining further evidence of such activity in the future." Visit League.org.UK to find out more about our work.